In my last post focused on dealing with RESTful APIs via PowerShell, I went fairly deep into how to construct the required key-value pair for Basic Authentication. This is a common and simple process for providing credentials needed to authenticate against an endpoint / resource over HTTPS. The next step is to create an API request. To start, I wanted to go through the process using the GET method, which retrieves data and should always be idempotent. While the goal is to showcase how to construct a GET request, a realistic endpoint makes it simpler. I’ll do this using a Rubrik cluster as my API endpoint. However, the principles shouldn’t deviate significantly across other systems. I’m going to break this apart into smaller chunks and explain what’s going on with the script. The first few lines are there to set up the variables used later in the script. I try to avoid hard coding variables into the script body, preferring instead to either declare them at the top or (better yet) allow the user to input them by defining parameters. But, this is just a simple script for demonstration purposes, so I’ve hard coded them at the top. The $server variable contains the FQDN of my Rubrik cluster. The $uri variable builds the Universal Resource Identifier (URI) which is the endpoint / resource that I’m going to send my GET request to. Now that the variables are out of the way, I wrap the Invoke-WebRequest cmdlet within a Try / Catch. If you’re new to this, go read my Using Try and Catch with PowerShell’s Invoke-WebRequest post. The response is saved to a throw-away variable (meaning I often re-use it later) named $r. If the API request results in an error, the Try will fail and the code within the Catch area will execute. While the StatusCode and StatusDescription aren’t used in this example script, they are handy for validating that the API request was successful. This is especially true for requests that are doing something – such as a PUT or POST that updates data. 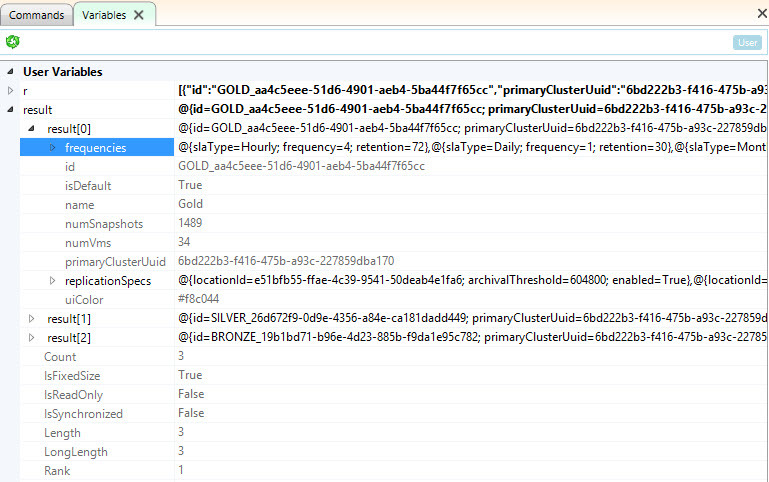 For a GET request, I find that it’s often enough to check the Content key to see if any data was returned. If not, we can assume that either no data exists or the request was not submitted correctly in some fashion. Most RESTful APIs use JSON or XML to transmit data back and forth. 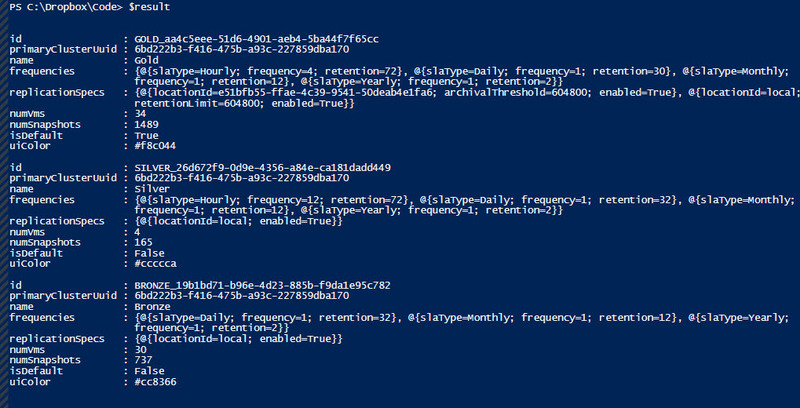 PowerShell can natively convert this sort of data into something it can use and is easier on the eyeballs. This is where the last important bit of code comes into play. By passing the value of $r.Content into the ConvertFrom-Json cmdlet, we can format the body of the response into something useful. That data is held within the $result variable. It is this variable that drives all future possibilities from the script. That’s a much more familiar looking hash table (key-value pairs). Using the ISESteroids variable explorer can also show the data in a GUI-friendly manner. Here’s an example of what you can do with the resulting data from a GET request. Perhaps you’re curious how many virtual machines are being protected by each SLA Domain? Easy enough. There’s a near-infinite number of things you can do with the data, and I often find myself using the GET method to provide user details or drive further automation that issues a PUT, POST, or PATCH. In my next post on this topic, I’ll use data from this request to update a virtual machine’s SLA Domain using the PATCH method.